# Create color gradients of various shapes and sizes on a canvas. # Create a gradient on a canvas. The gradient will be placed at the top of the display list. 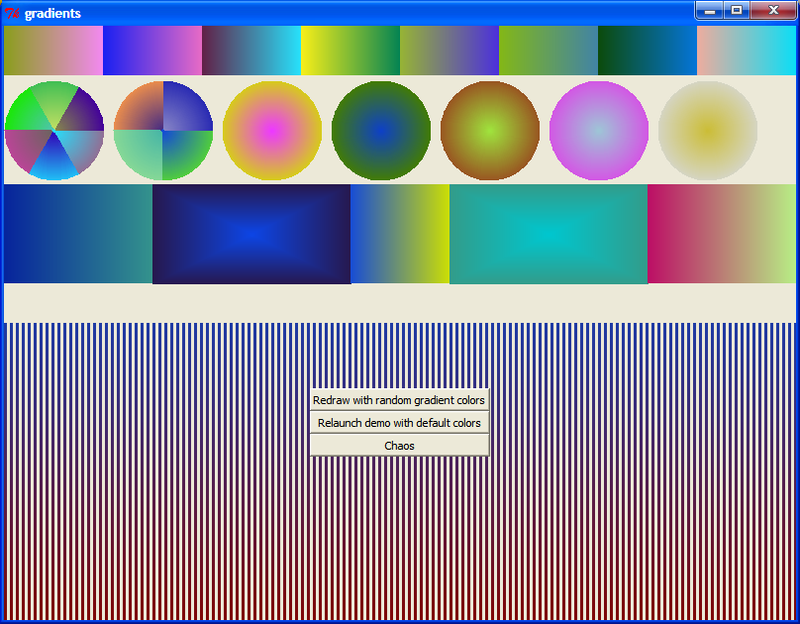 # Ensure valid colors are provided while also converting to lists of 16-bit RGB values. # Delete the gradient if it already exists. # Create a hidden canvas item to store meta data about this gradient. # Intercept the -animate option. # Create the canvas rectangle items. # Create the canvas oval items. # Create the canvas arc items. # Create the canvas line items. # Delete the meta data and throw an error. error "invalid orientation: $orient; must be: vertical, horizontal, circular, central, or arc"
# Same as draw, but if the gradient already exists then it will retain its position in the canvas's display list after being redrawn. # If the gradient already exists, remember its location in the display list. # Move the gradient to its previous location in the display list, if any. # Shortcut procedure to change the colors of the gradient. Same as redraw but introspectively determines some meta data. # This will use the gradient's x/y location when it was last drawn. # Retrieve the gradient's meta data. # Redraw the gradient with the new colors. # Shortcut procedure to resize and reposition a gradient. Same as redraw but introspectively determines some meta data. # Recreate the canvas lines with the new dimensions. # Retrieve meta information on a gradient. # This is supposedly a canvas item ID instead of a list of tags describing a gradient. Avoid introducing subtle logic errors. error "cannot provide canvas item ID in lieu of gradient tags: $tags"
# This is a list of tags for a gradient. Find the hidden meta item for this gradient. error "cannot find meta data for gradient with tags: $tags"
# For a canvas item ID, return all tags that are not gradient meta tags. # Calculate a list of center-to-outward colored rectangles suitable for [canvas create rectangle] or [canvas create oval]. # Decrement X by one pixel in both directions. Decrement Y by a fraction in both directions. # The Y axis will be more heavily concentrated. # Decrement Y by one pixel in both directions. Decrement X by a fraction in both directions. # The X axis will be more heavily concentrated (unless width==height). # Calculate a list of left-to-right or top-to-bottom colored lines suitable for [canvas create line]. # Calculate the color for each horizontal line. # Calculate the color for each vertical column. error "invalid orientation: $orient; must be: vertical or horizontal"
# Calculates the color at the specified index between rgb1 and rgb2 where rgb1 and rgb2 are the specified length apart. # Throw an error if the index is out of bounds. error "index $index is out of bounds for length $length"
# Determine the ratio between each starting component color and ending component color. # Calculate the new component colors at the given index. # A hacky workaround to make up for a lack of precision (or faulty math?). # Convert the integer RGB values to a hex color. # speeds up drawing of images two-fold (I haven't benchmarked this for canvases). # Converts 8-bit RGB values to 16-bit RGB values. # Returns a random 8-bit hex color. # Randomize colors for all canvas items. # Create a toplevel window with a canvas filling the contents. # Fill the bottom of the screen with a striped green fade. # Draw a strip of rainbow. # Draw some balls with diameters of 100. # Display some control buttons.